Pictured in this undated photo are members of the Kappa Boulé, the Atlanta chapter of Sigma Pi Phi, which was established in 1920. Sigma Pi Phi records, Stuart A. Rose Manuscript, Archives, and Rare Book Library, Emory University. The records of Sigma Pi Phi, the first post-graduate fraternal organization for African American men, have found a home at Emory's Stuart A. Rose Manuscript, Archives, and Rare Book Library. Sigma Pi Phi, also known as the Boulé, was founded in Philadelphia, Pennsylvania, in May 1904 by Edwin Howard, Algernon Jackson, Henry McKee Minton and Richard Warrick. It was the first Greek-letter fraternity to be founded by African American men. Unlike undergraduate fraternal organizations, membership is limited to men who have already achieved some degree of success within their chosen profession. Rose Library Director Rosemary Magee notes that Emory "is truly honored to have been selected to house the papers of this significant fraternal organization." The collection at the Rose Library consists of more recent administrative records (1941-2013) related to the fraternity and the Boulé Foundation, as well as the Boulé Journal archive (1926-2015) and photographic collection of members and events (1987-2015). The historical records will remain with the archive at Fisk University. Cole adds he is looking forward to interested persons learning more about the Boulé through the Rose Library archive. After its founding in 1904, Sigma Pi Phi quickly grew into a national organization, with chapters set up in Chicago, Baltimore and other cities. Chapter representatives met in Philadelphia in 1908 to establish the Grand Boulé to provide central leadership. The first edition of the Boulé Journal was published in 1912 to facilitate communications among its members. Today, the Boulé has 133 local chapters and more than 5,000 members across the U.S., in the United Kingdom and in the Caribbean. 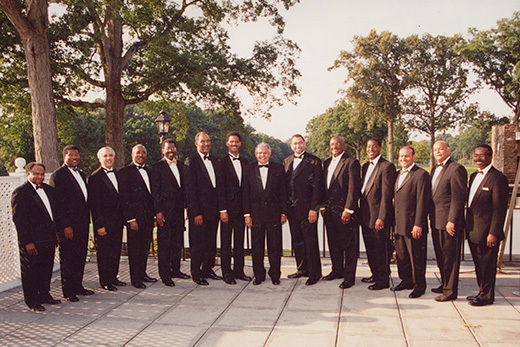 Notable members throughout the years have included W.E.B. Du Bois, Martin Luther King Jr., Vernon Jordan, Benjamin Mays, Whitney Young and many others. Among the Rose Library collections are the papers of other Sigma Pi Phi members, including Horace Mann Bond, James Weldon Johnson, Kelly Miller, James A. Porter and Carter G. Woodson. The Atlanta chapter, Kappa Boulé, was established in January 1920. Members well known in the Atlanta area over the years include former Atlanta mayor and U.N. ambassador Andrew Young, U.S. Rep. John Lewis, former Atlanta mayor Maynard Jackson, and Braves baseball player Hank Aaron, to name a few. Members with an Emory connection include Robert M. Franklin Jr., author, former Morehouse College president and Laney Professor of Moral Leadership at the Candler School of Theology; and James R. Gavin III, Emory University trustee, clinical professor of medicine at Emory University School of Medicine and former president of Morehouse School of Medicine. The Boulé Foundation, founded in 1980, is the social action arm of the organization, used to fund scholarships for deserving youth and to make contributions to disaster aid efforts such as Hurricane Katrina and the earthquake in Haiti. Both the fraternity and the foundation made a substantial donation toward the building of the National Museum of African American History and Culture at the Smithsonian, says Samuel Bacote, Grand Grammateus (executive secretary). The collection is open and available to researchers and the public; electronic records are undergoing processing and are unavailable at this time. To learn more about working with the collection, please visit the Using Rose Library page.